Posted by Toy Lady in Cook's Illustrated, Cooking, Food. I love a nice, hearty stew, don’t you? And our old stand-by, thrown-together beef stew is definitely that, that’s for sure! But sometimes, a gal just wants something – different. Richer. And so, just like we do for chocolate, we look to our friends the Belgians. In fact, I’m sure if you asked him, Peeps would tell you, in great detail, how, not only do Belgians excel at chocolate, they’re ace beer-makers, as well. Boy, those Belgians sure do know their way around a menu, don’t they? Somewhere between the beer and the chocolate, they took some of that beer, a bunch of beef, and some onions – a whole mess of onions – and came up with one of the most delightful stews we have ever enjoyed! Of course, credit where it’s due – we wouldn’t enjoyed this stew without the good people at America’s Test Kitchen – I first printed the recipe, after we’d see it on an episode of ATK, back in 2007. And we’ve been enjoying it (when we think of it) since. 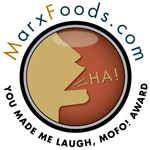 several onions – a LOT of them! – sliced about 1/4 inch thick and cut in half. If you’re doing it by hand, you’ll want to halve them first, and if you’re using a V-slicer or a mandolin, you’ll want to slice them first, then halve the slices. Trust me. 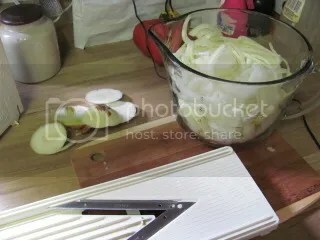 Ultimately you want 8 cups of sliced onions, which, for me, was 4 large-ish onions. Your mileage may vary. 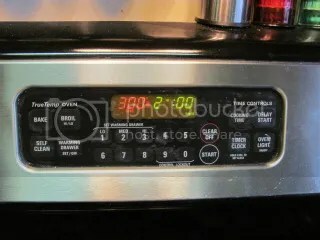 Adjust your oven rack to the lower middle position and preheat the oven to 300. Take your heavy-duty Dutch oven and heat some oil over medium-high heat, maybe a tablespoon or two, and, when it’s nicely hot, start browning your dried, seasoned meat in batches, being careful not to crowd the pan, browning each side well. You’re going to be here a while. 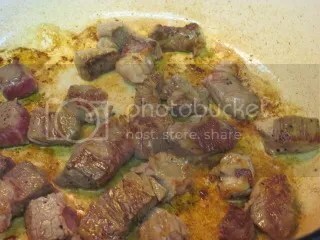 Remove the beef to a separate bowl as it browns, and add more oil as necessary with each batch of beef browning. You’re going to have a bit of a mess in your pot, but that’s okay. 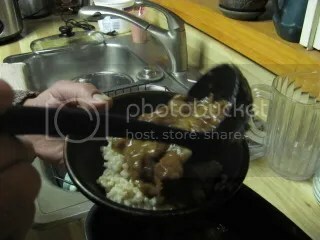 Right, we deglaze the pan. With onions! Gosh, I love doing that! 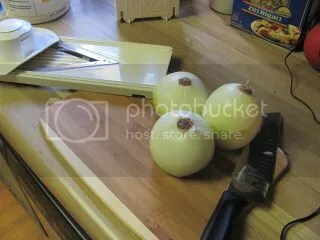 There’s just so much liquid in the onion slices that as soon as they hit the heat, they just start leaking like crazy! 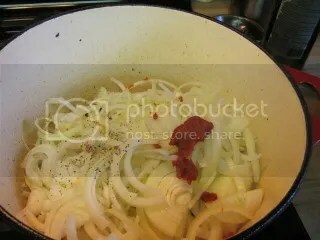 And before you know it, that pot full of onions cooks down to, well, less full. On low heat, along with the onions, add 1/2 teaspoon of salt, a little black pepper if you’d like, and a tablespoon of tomato paste, and stir and scrape the bottom of the pot to loosen any bits of fond. Once the fondy bits are scraped, and the onions have started to soften and cook down a bit, you can raise the heat to medium and let it cook until the onions are starting to brown, about 12-15 minutes. 3/4 cup EACH chicken and beef broth – or a combination thereof. I think I had close to a cup of chicken broth and just supplemented that with a little beef broth. Beer! Since it’s a Belgian stew, the obvious answer is to use a Belgian ale – and we do make it a point. Usually we’ll grab a bottle of Chimay, but this we decided to have some fun. You’ll only need 12 ounces of Belgian ale for this, but if you end up getting a bigger bottle, well, I’m sure you can find something to do with the rest of it. We did. Back to the stew pot. Your onions are cooked ever-so-slightly browned at this point, so you’ll stir in the minced garlic, cooking just until it’s fragrant – about 30-45 seconds. Then stir in the flour, continuing to stir a couple more minutes, until the onions are fairly evenly coated and the flour is starting to brown. Add the broth (all of it), scraping again as necessary, then dump EVERYTHING else in – the meat, any accumulated juices, the beer, the herbs, and the vinegar, plus a healthy pinch of salt & pepper for good measure. Bring everything just up to a gentle boil, stirring occasionally, then partially cover the pot and stick it in the pre-heated oven and walk away for a couple of hours. 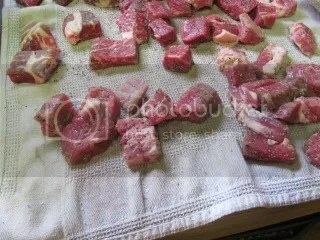 After two hours, check the stew by inserting a fork into a hunk of beef – if there’s little to no resistance, it’s done. If it resists, back in the oven it goes for another half hour. Then it’ll be done! 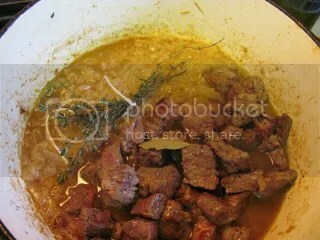 Of course you’re going to want to pull the thyme springs and the bay leaves out of the stew, and, personally, I prefer to let it rest at least overnight before reheating and serving. You will notice that there were NO vegetables (other than onions) (and really, I think onions are technically an herb, aren’t they?) and there was NO starch. Maybe think about a salad. Noodles or mashed potatoes are evidently traditional with this stew, but we opted to serve it with barley. Carbonnade flamande is awesome, try one of the recipes with mustard or gingerbread/gingernsaps added if you want to amp up the sweet sour flavor. 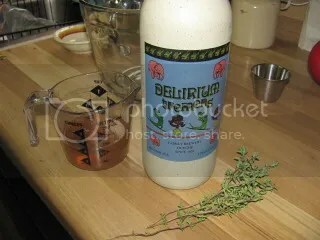 I’d personally stick to an abbey style dubbel or oud bruin instead of the Delirium. HI, Ryan, yes, did a sauerbraten a while back that included gingersnaps and yes, that was very good – thanks for the reminder! Ah, carbonnades a la flamande — one of my favorites! I will confess to often making it with Newcastle Brown Ale. And if you ever take the notion to make spaetzle — put it over that! Newcastle would be, I”m certain, a perfectly acceptable substitute beer, I’d imagine. And I’d love to try spaetzle – but I’ve never made it. Is it difficult? I’ve never made it either. It doesn’t LOOK that difficult — you make up your batter, and then drip it into boiling water through the holes on your largest grater. That is, if, like me, you don’t have a spaetzle-maker anddon’t intend to purchase one. I love cooking with beer! Dark beers give even more flavor to beef. I make a stew with the darkest beer I can find at the grocery store, cut the chuck roast into cubes, and add potatoes, carrots, celery and onions and of course tons of garlic. Throw all that in the crock-pot and let it do it’s thing. It is wonderful and comforting!!! The weird part is… I don’t even like to drink beer.